Build and develop your own farm and enjoy amazing adventures! Farm Days is a free-to-play farming and farm management simulation online game, a farm game that takes you to a land full of farms, plants, crops and animals. A colorful place where you’ll be amazed by a unique atmosphere and charm. Plant, harvest, feed, cultivate, build, and visit! Farm Days’ landscape is full of agricultural wonders such as fields of different crops, vegetables, trees and water features (including wells, streams, ponds and more). On top of that, there are manmade structures which you’d expect to find on a farm, including barns, mills, bakeries and more. This environment helps you immerse yourself into a world of agricultural life. 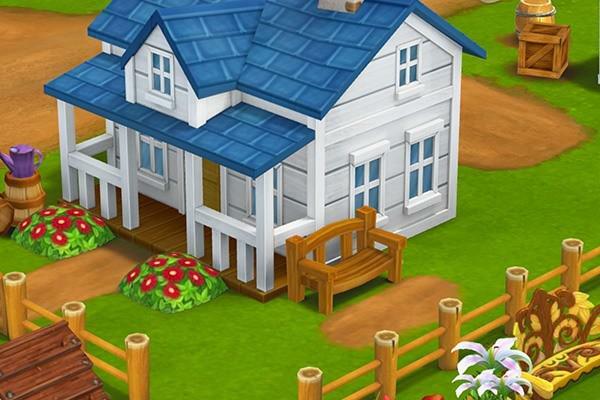 During the game, players will experience how it is to live on the farm and will need all their skills to expand their holdings and gather all products necessary for the progression. The core focus of the game is to build up your farm and soundings by doing quests, gathering resources and earning money. Doing this will allow you to buy new buildings, level-up and access higher levels of crops, animals and structures. 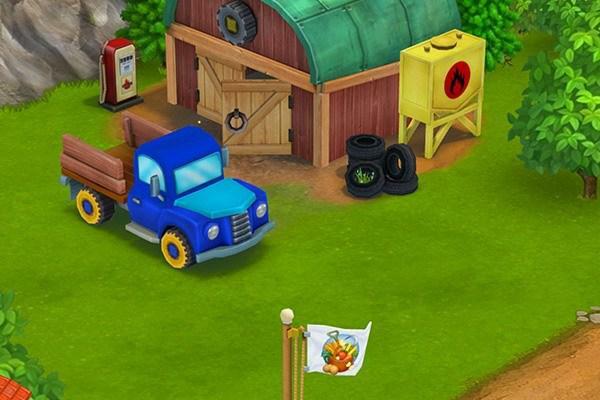 You will also be able to convert more wild terrain into your farm. A main challenge will be managing your resources, time and storage place. Doing all that you will try to earn as much money as you can to hasten your progress and compete with the farms of other players. Each player starts by gaining access to a relatively small portion of land. All you have at your disposal are a farm house, a well and a small patch of land with soil that is ready to take seeds. Your first decisions are made right from the start and are guided by the farm game as a basic tutorial. Those simple tasks are building a barn and a mill, planting crops and using water from the well. What stands out in Farm Days is a system of watering the plants and crops. All plants need regular watering so the player is engaged more often and needs to think about their water source and how often to use it. It is worth noticing that the water supply may eventually dry out. The core game mechanics, as in most farm games, centers around the production cycle. How it works is that the player produces items (crops, or fruits or other basic resources) that can be either used to create more complex items (for example bread, pies, sugar and more) or can be stored, sold on the market or consumed by quests. Crops can also be used to feed farm animals such as cows to get milk, or chickens to get eggs. Once you have more “advanced” ingredients you can use more complicated recipes. 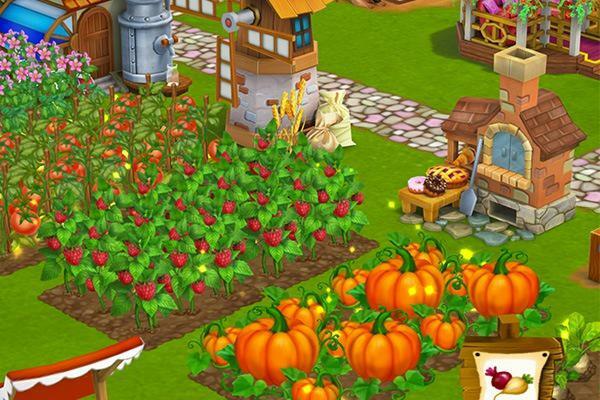 In time, the amount of basic resources grows, as not long after the start of the game the player will acquire the ability to plant new trees and vegetables (pumpkins, strawberries, plums and much more). This production cycle must be closely managed, as each building can only create one item at a time. Furthermore, different items have different production times and players must manage their time and order in which they create things to stay efficient. You cannot make only easy and fast items as they will flood your Barnyard and more complicated items are necessary for completing quests and leveling-up. A surplus of production and lack of space for storage can be solved by selling stocked products on the market. To build your Farm Days empire from the beginning, quests appear throughout the game as to-do lists. Once a certain quest is completed the game will reward the player with experience points, money (Farmbucks) and special items. Once certain missions are completed, we gain access to the next ones. Experience points rewards are necessary to level-up. Farmbucks are in-game currency and can be used in various useful ways. For example players can sped it to speed-up crop growth, production of materials or even to raise-up farm buildings. This currency can be obtained not only as a reward for quests but also in exchange for watching videos. Standard quests typically instruct players to complete specific tasks and new recipes (in order to produce items and combine them, for example in a mill). Some of these tasks have a time limit and those quests usually have the biggest rewards. Other types of missions that players will encounter are quests that give access to new plots of land to expand and build on. It’s also important to notice that the game uses a system of achievements that have special rewards. For example, producing and harvesting a specific item will be awarded at some point with Farmbucks. But besides money, players also receive another important object. Quick Grow Seeds allow players to skip the crop growing delay and make crops instantly ready to be harvested. An alternative method of gaining the Quick Grow Seeds is socializing with other players and in-game friends. 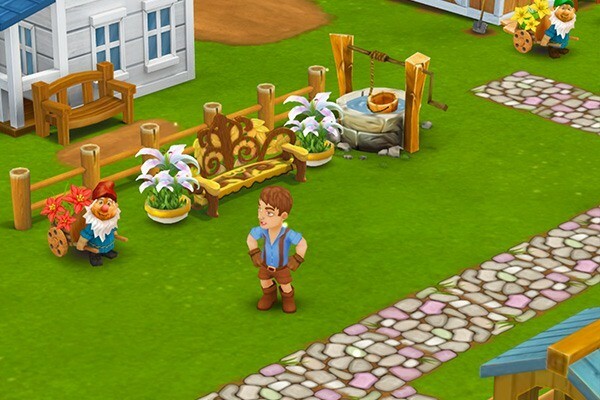 Farm Days is a great game that charms players with colorful and live 3D graphics and immersive game mechanics. When it comes to farming games, you won’t find a better one than this. Your Farm Days empire awaits! Check out other free simulation, economic or adventure games online Knights and Brides, Klondike, Game of Emperors.